The Opera is Always on the Table places us into a dystopian environment where the effects of war have infiltrated the kitchen table. Missives of “fallen cities” come to us via texts on “Mom’s” cellphone while she tries to set boundaries for her teenage “Daughter” as if its a normal day. It’s a bleak look at the fallout of soldiers returning home riddled with PTSD and the consequences of neglecting this veteran’s precarious mental health. The piece has been written by Hanna Lea Novak who is adept at writing complex dialogue to reveal plot. The text evolved out of a response to Sophocles Ajax – the story of a bad loser ex-soldier who is ultimately transformed from degradation to hero through the act of taking his own life. I suppose the characters of Ajax concubine, Tecmessa, and daughter, Eurysakes, could be the basis of the contemporary characters of “Mom” and “Daughter” in Novak’s play. The central character driving the piece is the daughter and we see her ruling the roost with petulance, entitlement and stubborn self absorption. She is seemingly blissfully unaware of the horrors happening in the house and is consumed with the usual teenage dramas of first kisses and wanting to fit in with the cool kids. It’s a clever counterpoint between youthful attention seeking and adult self destruction. I feel this text is in its early stages. I think it needs to be developed into a full length work where we could possibly meet the character of Miemie, who is just spoken about in exposition. We don’t feel anything for what happens to her in the house as we have no information about her to form a bond. It would be great to meet the Father earlier in the piece so we can also be more invested in his downfall and possible transformation. There is more potential in this work and I think Novak could create a defining piece if she developed it further. But it’s a great start. Zoe Wilson in the role of the daughter is captivating. This 16-year old is a multi-talented singer and actress with an ability to portray a wide range of emotions. She anchored the piece with her strong presence and attention to detail. Emily Cass McDonnell as Mom, and Ben Williams as Father were good support in the smaller roles. There is a 5-piece band, under the musical direction of Zach Philips, that underscore the show from behind a curtain. 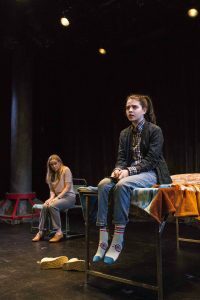 I did not understand the choice of having them hidden throughout the show as I felt they could have been used to greater effect in being the emotional undercurrent of the piece, accenting shifts in mood and musically portraying the subtext of the characters. It would have been simpler to just use a backing track as they don’t currently serve a theatrical purpose in the play. In the curtain call they are revealed, play a song and then you feel the missed opportunity for them to have been more effectively integrated in the work. I would have loved to hear more than the one song in the play to flesh out the different character’s subtext and back stories. Tina Satter and Hanna Lea Novak tackled the direction of the short play with gusto and created some lovely moments. They can, however, do away with the lengthy scene changes that don’t add anything to the story. Platforms, like Ice Factory, that provide emerging artists with the opportunity to explore their work are vital to the development of great playwrights. Novak is on to something with The Opera is Always on the Table and I look forward to seeing it again when it reaches the next stage of its necessary development. The Opera is Always on the Table was curated for the 25th Anniversary of the Ice Factory festival by Half Straddle. Running time: 45 minutes with no intermission.